The Ecco E1 wall mount mailbox is designed to compliment your home's exterior with a contemporary style. The subtle curved front design is unobtrusive and light in feel. The sloped lid allows for easy mail retrieval and the see-through windows let you spot mail in an instant. 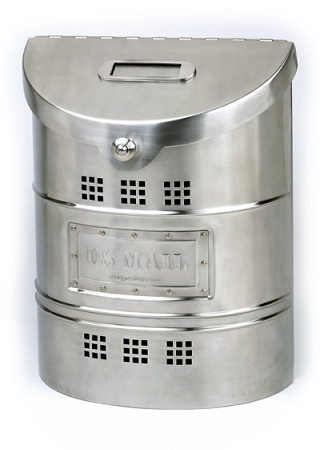 Made of 20 gauge steel, the mailbox has a brushed stainless steel finish and brushed stainless steel label. Mounting hardware included. For a larger size in the same style, please see the E2 mailbox section. 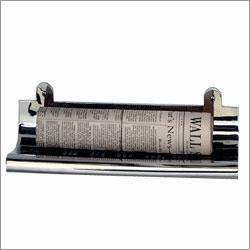 Made from heavy gauge stainless steel, the newspaper shelf is curved just enough to nestle your newspapers with a beautiful rounded edge. Available in both polished and brushed finish. 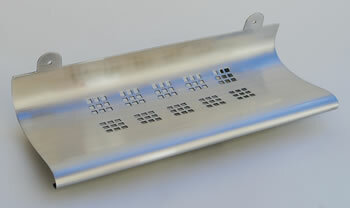 The curved design features the same square perforations as the mailbox. The holder is mounted on a wall using the 4 provided screws.